Mason, Wis.- Kylie Burhans wants to be a police officer when she grows up. That’s why she decided to take part in the Rescue Divas EMS Summer Camp for girls, hosted at Camp Northwoods in Mason Wisconsin. “To be a police officer you need to know how to help people,” said Kylie. “I wanted to learn how to help people in actual emergencies. The 5 day camp offers courses like CPR training, basic first aid training, and gives the girls a chance to get in a real ambulance. 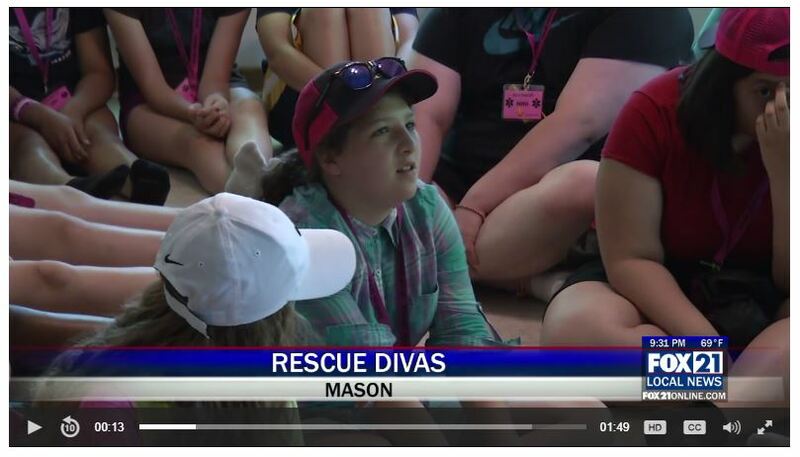 According to Carrie Okey, Rescue Divas Camp Director, the camp was created to address the shortage of Emergency Medical Technicians in Northwest Wisconsin, and its goal is to get middle school aged girls interested in thinking about being EMTs. “I have a personal passion for helping girls succeed. I think lots of little boys get the opportunity to climb on fire trucks and I wanted girls to get the opportunity to climb in an air ambulance and try search and rescue, and do all the other things they might not get to do,” said Okey. But the skills taught can be useful now, not just in the future, and that’s why year after year, the program is popular. “My little brother he’s got a lot of allergies to a lot of different things, so living in that type of environment is dangerous for him, so if anything happens and my mom isn’t around or anyone isn’t around I want to be able to help him,” said Morgan Otten, another Rescue Diva attending the camp.